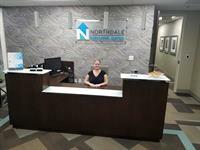 Signature WorkSpace - Northdale offers private office rentals, virtual offices, conference room rentals and day office rentals within our brand new world class facility. Our office solutions are perfect for small businesses, start up businesses, satellite offices for large corporations, attorneys, therapists and CPA's. All private office tenants enjoy free dedicated fiber internet and WIFI, unlimited free usage of our conference rooms, full time receptionist to greet clients and sign for packages, complimentary gourmet coffee & snacks, 24/7 building access, onsite management and maintenance and breakfast every Thursday.